Album TD, album design for busy photographers with creativity. Designing an album usually takes a lot of time from an already busy photographer’s life. But a photographer needs to stay ahead of the crowd and needs any option that can help him be creative or different. That’s where Album TD comes in, a stand alone, fast and inexpensive software. Album Turbo Design fills the need of professionals looking for a tool to design albums in a fast and clean style but doesn’t restrict them to a few known layouts. Album TD is a downloadable software available both for Mac OS X (version 10.7 or higher) and Windows (Vista or higher). A Sample album is included with a few already designed spreads. Working area is pretty simple and intuitive, also help balloons are available while hovering the mouse over an element for the first steps, later you may disable this option at references. © Album TD benefits from 2 working areas: single and grid. 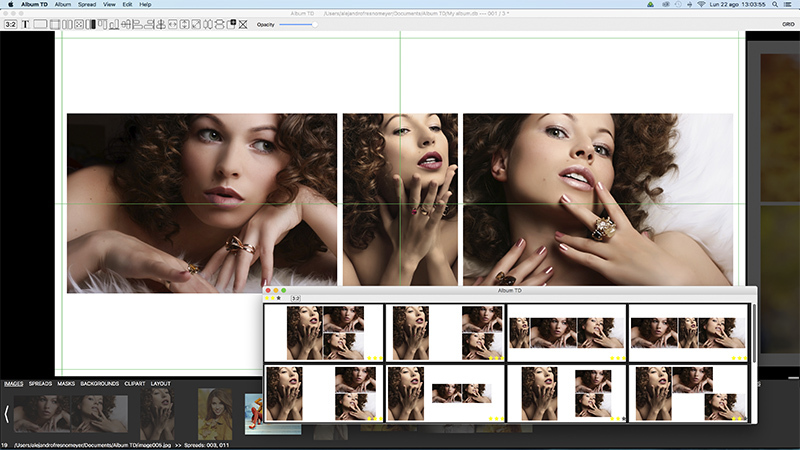 In single mode a dark main spread editor is available at center with side navigators to change to next and previous spreads showing them partially, they also serve as drop target for images: just drop a few images at right to create a new designed spread, if you drag over for an instant this spread becomes the active one and ready for any change. To move and resize images or layers you don’t need to use additional icons or menus, just press Shift and drag to resize an image in his layer, press Ctrl (Cmd for Mac users) to move the image inside the layer or simply click at a layer and drag from borders or the image itself to resize/move the layer, effective and fast. At top you’ll find the icons toolbar for setting 3:2 mode, adding text, gap and margins or other design options like flipping the spread(V/H) or aligning and resizing images. An automatic magnetic alignment is included and helps to position images with high precision. At bottom a resizable images list is available, it changes from single horizontal scrollable row with larger images to a multi-row list, larger previews of images are available while hovering the mouse (can be disabled at contextual menu). 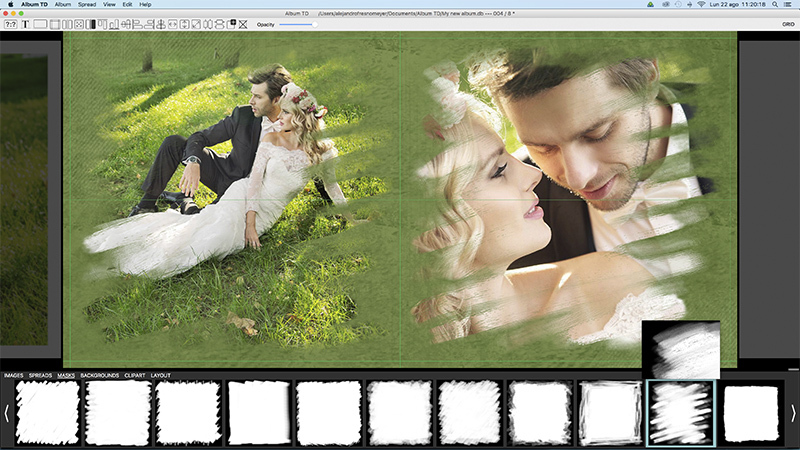 This bottom panel is also shared with spreads, masks, backgrounds, clipart or layout. To keep things simple and fast many options are available by using shortcuts like adding a new spread (Ctrl/Cmd +N), saving spreads (Ctrl/Cmd + S), showing next spread, etc. 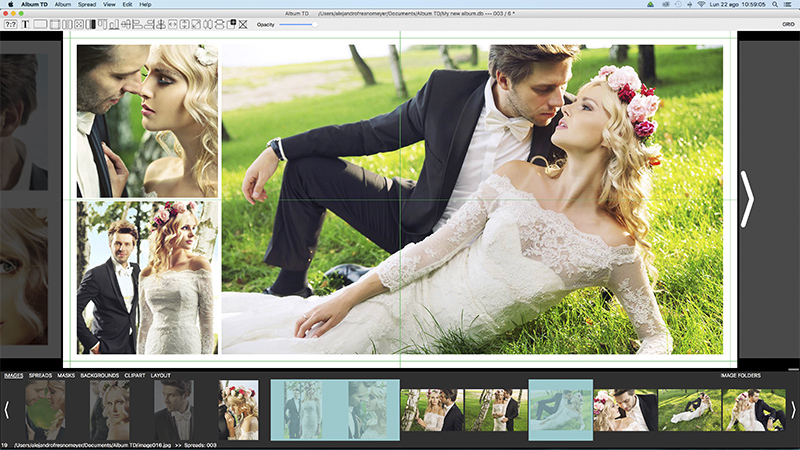 Right clicking the mouse will open the contextual menu for images (both at the list or in the editor), layouts, background, clipart, text or for spreads in the grid. This menu includes options to rotate images, layers, apply sepia or black & white effect or edit the picture using the integrated editor to set levels, brightness and contrast, hue and saturation, shadows, highlights or smooth/sharpening the image. To add images just drop them from the bottom list or from external sources like Finder, Windows File Explorer, Bridge, etc into the spread at the editor, you may also use the contextual menu at the images list. Album TD lowers the opacity of used images at the bottom list or you may hide them using the contextual menu. An interesting feature is the panoramic/double layout option, it is changeable at the icons toolbar at top but also by dropping images at the 20% most at left or right of the spread. A double layout spread has independent layouts for left and right and the virtual center of the spread is movable to left and right. In Grid mode all spreads are visible at once and you may drag images from the list (or external source like in the main editor) into any spread, a design is created automatically and you may use the layouts list at bottom to select a different one if needed. The 20% option is also available in grid mode and a bright yellow area indicates the dropping target. In Grid mode you may reorder the spreads or remove them using the contextual menu. 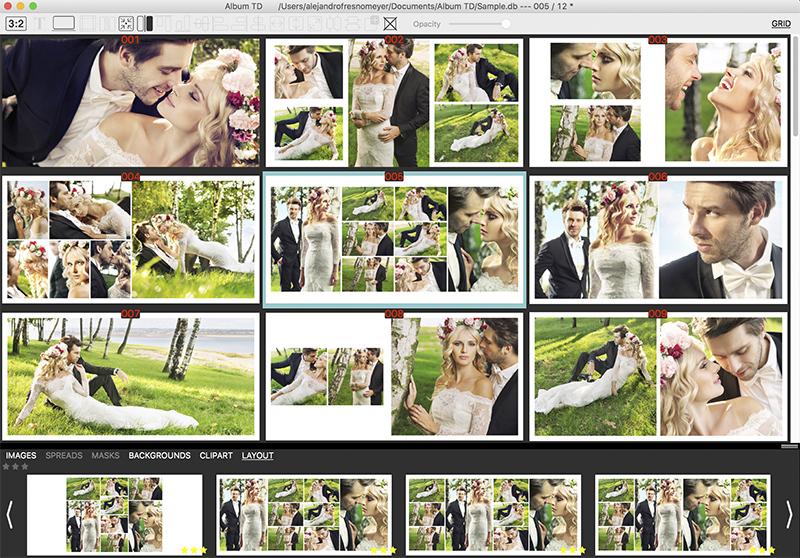 This album design software is unique at offering an option to design all spreads in a single view. 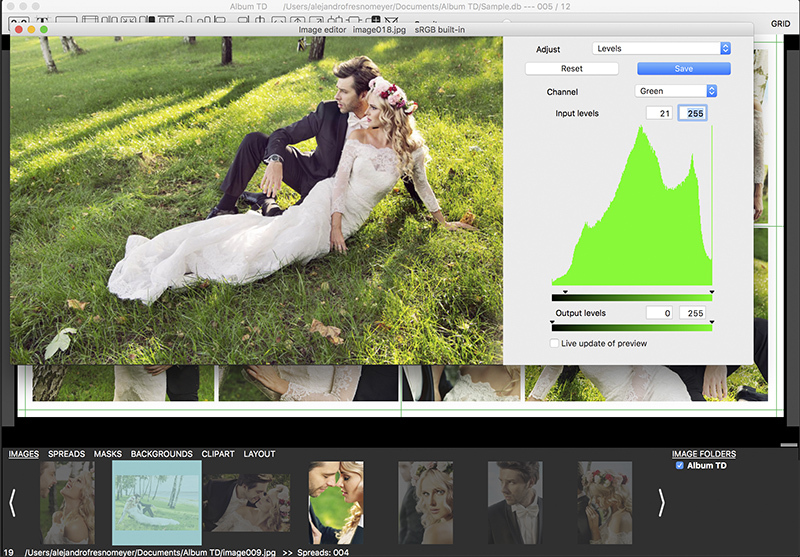 If you are looking for simple designs to show your images at full size activate the 3:2 mode at the toolbar, you’ll get designs to keep the aspect ratio of your images and the main editor will only allow resizes keeping this ratio. Setting a default gap and distance to spread borders can be done at album sizes, Album TD accepts any album size from any manufacturer, it even includes some predefined sizes of well known labs. But you may also use the toolbar to set a different one, layouts list will be updated to show a true preview of the result with this settings. And enabling layout variations at contextual layout menu shows a full list of possible designs, almost an infinite combination. But your style may be different or you are just looking for an alternative design, no problem. Album Turbo Design includes masks, backgrounds, clipart and text options; you may set an image as background or use one included with the application. Even adding your own masks and backgrounds or clipart is simple, drag them to the lists at bottom to include them in the library. Background colors can be set for left and right of the spread, and a contextual menu allows for setting hue and saturation or opacity. Clipart can be colorized and rotated and masks customized using a brush to get the best fusion between images. Users with a double monitor system can benefit from the additional floating windows for masks, backgrounds, clipart or layouts; they can be moved to the auxiliary monitor for the fastest design workflow. Once your design is ready you can export it with full color management to JPG or TIFF files, if needed splitting into left and right pages. 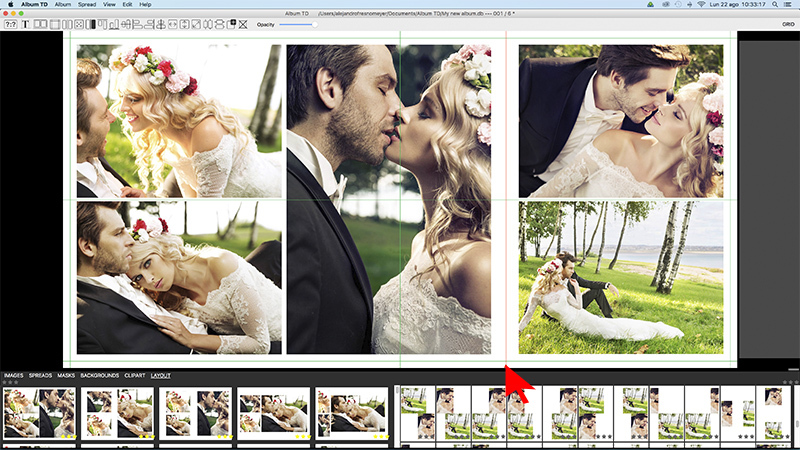 Preview files can be created for album proofing with watermarked JPG’s or a PDF. And if you have Adobe Photoshop CS to CC2015.5 installed then you can also export spreads in PSD format, full layered documents with uncut images as smart objects. Album TD has been awarded with Hot One 2015 for the best album design solution by Professional Photographers Magazine and is developed by Art Fotografic in Europe, the same company who created awarded Album DS eleven years ago. Art Fotografic is a small company developing software for photographers, established in 2005, their products are being used in more than 75 countries around the world. With Album TD they have created a fast and efficient tool for the album design, fulfilling the needs of almost any photographer’s style and at same time keeping costs low; this software is available now for only 125€ (don’t forget to ask if there is an extra promotion running). Support is always happy to help you, and updates are for free until next major version. A full working trial version for 30 days, no watermarks, is available at product’s website Album TD where you will find as well video tutorials and other help for your album. Here’s a video Album TD put together, gives you a summary of the interface.